The folks at Homeland Security are ready to fork over close to half a million dollars for pepper gas guns that will do a better job of gassing more folks faster. The estimated cost for this requirement is $498,970.00 with delivery to be made 60 days from date of award. This order is being issued under the authority of FAR 8.405-6 (a)(1)(i)(B). FAR 8.405-6 (a)(1)(i)(B) allows for "Only one source is capable of providing the supplies or services required at the level of quality required because the supplies or services are unique or highly specialized." 5. Demonstration That the Nature of the Acquisition Requires the Use Authority CitedPepperball Technlogies has developed and pushed forward industry standards with regards to less lethal technology. 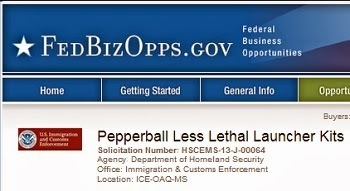 FPS has had previous experience with the Pepperball Technologies' Less Lethal Launcher System. Any change from the Pepperball Technologies' Less Lethal Launcher System would require NFTTU to make substantial changes to their less lethal training program. Such changes would cause a significant cost to the government and those costs would not be expected to be recouped through competition. Furthermore, the time required to implement a new training program would result in an interruption in the service and capabilities that could impact the agency's operations and endanger the safety of law enforcement agents. Also, since the implementation of the Pepperball system by FPS, any change to that system may impact FPS policy and result in collective bargaining issues. The Pepperball Technologies' Less Lethal Launcher kits are substantially different in appearance to existing firearms in FPS inventory. Standards set forth by FPS and the law enforcement community require lethal and less than lethal equipment to appear different to the operator to minimize any potential safety concerns. Pepperball Technologies Inc. produces several launcher models and is the only manufacturer that provides a product specific system to meet this standard required for agents in the field during training and operational deployment. The company receiving this contract is based in San Diego, Ca. We tend to stock our pantry canned goods well in advance, and do a pretty good job rotating stock. But occasionally, something out of date shows up. Last week, I came across of can of peaches with a December 2011 expiration. Not quite two years past its official shelf life. Nope. I didn't toss it. I chilled it. Had 'em with lunch today. Maybe, just maybe, there was some degraded taste. But I hardly noticed. 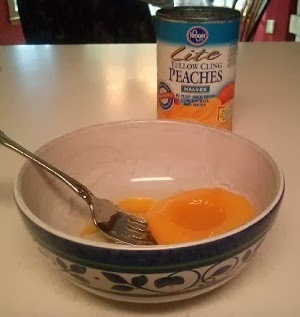 Of course, you should usually try to consume food items within their posted dates. But expiration dates aren't necessarily a drop dead date. So when I come across an old can, I'll check it out before discarding. Goes without saying, it the contents look bad, go ahead and discard 'em. Florida's Stand Your Ground Law was the focus of a hearing yesterday by the U.S. Senate Judiciary Committee in Washington, DC. Sybrina Fulton, the mother of Trayvon Martin, was the star witness. But Senator Ted Cruz (R-Tx) took time to challenge some of the presumptions stated as fact at the hearing, while at the same time, offering words of condolences to Ms. Fulton over her loss of son. The Dallas Morning News has more on yesterday's hearing. Another American industry dies as a direct result of the EPA. At least we're now on notice. The Left thinks it's ready to start squeezing the little people with inflation. The Fed has worked for decades to suppress inflation, but economists, including Janet Yellen, President Obama’s nominee to lead the Fed starting next year, have long argued that a little inflation is particularly valuable when the economy is weak. Rising prices help companies increase profits; rising wages help borrowers repay debts. Inflation also encourages people and businesses to borrow money and spend it more quickly. As inflation accelerates, economists agree that any benefits can be quickly outstripped by the disruptive consequences of people rushing to spend money as soon as possible. Rising inflation also punishes people living on fixed incomes, and it discourages lending and long-term investments, imposing an enduring restraint on economic growth even if the inflation subsides. It may well be the level of intentional pain is about to rise on those who can least stand to bear it. Give Obama what he wants on immigration - or risk flooding the land with illegals knowing Obama will refuse to deport any of them. That's apparently how Democrats want to play it. At least one is bold enough to proclaim it. "There are devastating effects if the Congress of the United States cannot enact comprehensive immigration reform – then the president of the United States has the responsibility to act to defend those immigrants which he says he wants to provide safety and justice for," Gutierrez told Salon. Did I miss the part in the oath of office where the president vows to uphold safety and justice for illegal immigrants? Just like dealing with German Nazis. Appeasement doesn't work. The more they get, the more progressive Democrats demand - and put deeper and deeper threats behind it. It is past time to draw the line in the sand. Force the president to either abide by laws of the land - or put him in a clear position where it is obvious he's politically in default on his constitutional obligations. If Republicans again bow to threats and blackmail, they're as responsible for the coming destruction of America as the Democrats who act as the architects of our downfall. Did something yesterday I hadn't done in years. 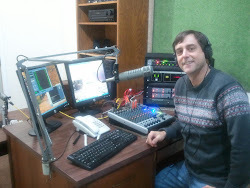 I spent an afternoon and evening poking around the shortwave bands. 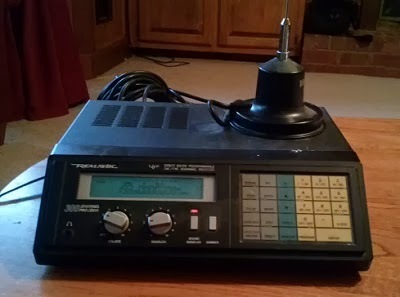 I was an avid DXer (long distance radio listener) as a kid and well into adulthood. But I sort of lost track of the hobby as the Internet grew into full swing. Well, I've been bitten by the bug again. But the neighborhood sure has changed. The BBC no longer targets broadcasts to North America, and I didn't intercept a single signal out of Moscow. Couldn't find Voice of America either, for that matter. Radio China International used to be Radio Beijing. Today, CRI announcers sound more British than the BBC of old I remember. Meanwhile, the English of some Radio Havana announcers sounds just as stilted as forty years ago. As for signals coming out of the U.S., there's plenty of preachers up on domestic commercial shortwave outlets. And there's some political talk shows, but most I heard seemed sort of fringy, with heavy focus on the New World Order. (I'm more focused on fact-based signs of a coming world disorder). 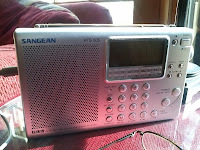 I plan to spend more time getting reacquainted with shortwave. Was a time, it was the only way an average American could directly access news, views and opinions from outside the states in real time. All that seems old fashioned, limited, even irritating with shortwave's static filled frequencies, when we have crisp, clear interactive Internet options today. 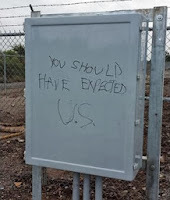 But for those who ever find themselves in a grid-down, long term loss of Internet situation, those who take the time to stay at least a little DX savvy will likely be glad they did. The web is rip-roarin' with comments about the new "girly hats" the Marine Corps has under consideration for adoption (My previous post). Now Stars and Stripes, a publication directed to those in the military, says the story as spun by the New York Post is "not true." At least the part about President Obama being behind the push. C'mon Stars and Stripes. Mr. Obama is Commander in Chief. Obama's DOD wants a more unisex military - and is breaking down gender barriers inside the services. There are a number of changes underway inside the military as the Obama team seeks a more progressive posture. Another service-oriented publication had the hat story before the New York Post. And, while not calling them "girly hats," the Marine Corps Times definitely notes the push for change is underway. And reaction to-date shows the proposed new look is extremely unpopular in the ranks. And Republican elites seem to suffer from some of the worst selective blindness in the history of America. The Obama era Marine Corps is said to be considering a make-over for traditional Marine Corps headgear known as covers. The New York Post says the Obama team wants a more unisex look for the Corps and the headgear that goes with it. That brings us to what some have dubbed "girly" hats. A simple uniform update? Or is this proposed change one more element of a soft purge where the administration does what it can to nudge more traditional Marines to call it quits and leave the Corps. The new covers aren't a done deal. Not just yet. There's a chance the Corps will keep its current covers, with female Marines wearing a slightly modified version, according to the Marine Corps Times. You've come a long way, America. But you need to turn around and go the other direction. The Obamacare debacle isn't the first whopper of a failure for the tech firm behind Obamacare's website. The company previously failed in an attempt to put together a national gun registry for Canada. Sure seems suspicious that Team Obama lined up a data company with a nightmare record. It's almost like they planned for Healthcare.gov to fail. I hope someone's working to follow the money on this one. Bad as things are, I suspect there's still more in play here than we yet know. 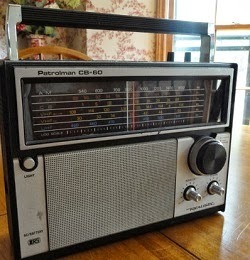 single battery powered portable radio offered for sale. 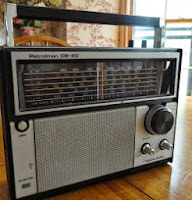 Sure, there are stacks and stacks of old VCRs or DVD players, but good old transistor era radios? Looking around on eBay, I see simple portable radios that would have sold in a thrift store for five bucks a decade ago now commands prices of thirty or forty dollars. Sometimes more. If you don't have a dependable battery-powered, multi-band radio for use in storms or other grid down situations - you may want to start looking. I tend to prefer the older, more robust transistor era radios of the 60s, 70s, and 80s to the newer chip-based stuff coming out of China. The older analog radios may be a bit sloppy in tuning today's crowded FM band near major cities, but most oldie-but-goodies are far superior in pulling in distant AM and SW (if so equipped) stations. Invited speaker and participant Mike Vanderboegh posts an after-action report on last Saturday's long-gun rally at the Alamo. Vanderboegh's report, at his Sipsey Street Irregulars blog, notes that Alex Jones was an uninvited party crasher. The Washington Post reports three teens are under investigation after 70 boxes of stolen TSA ammo were recovered from a car they were in. Keene Pumpkin Fest was held last weekend in Keene, New Hampshire. It was a record breaker. 30,581 lit jack-o-lanterns were documented, beating the previous record on set in Boston in 2006. Most sniper teams deployed at a small town fall festival event. Bloggers and YouTubers noted the police sniper presence. Exactly who were police expecting? Reasonable security move, or another example of our fundamentally changed, security obsessed Police State, USA? The Left apparently wants to wrap things up and declare victory in its fundamental transformation of America, but it can't bring itself to actually say it wants Civil War to mop up any resistance to what's been a largely quiet conquest. How to handle situation? Rather than declare a new civil war, why not pretend that those who dare diss the Obama remake are nothing more than guerrilla holdouts from the last one? Yes, I know Michele Bachmann is from Minnesota and Steve King is from Iowa, but all this proves is that in the 150 or so years since the Civil War, the vituperative Confederate agenda of anti-Americanism has managed to spread its irresistible redneck poison into benighted pockets across the country. Kind of like Waffle House. But to deny that the current attack on the federal government isn’t part of the hidebound Confederate agenda is to ignore the people who have engineered it and whose sedition will be rewarded with reelection. As I read this essay, I wonder how the writer expects to be taken the least bit seriously. Does Thompson already seek to divert the blame toward a bunch of "Confederates" for when Obama's house of cards comes tumbling down around the progressives who installed it? Or he may be coming close to saying it's time to deny a voice in government to opponents of the Obama agenda. Time to declare martial law? I know, I'm trying to apply logic. But it seems I'm trying to make sense of nutcase progressive who thinks he and his progressive cohorts are still fighting the ghost of Robert E. Lee rather than admit the destructive nature of Barack Obama's fundamental transformation (aka revolution) is finally getting some legitimate contemporary push-back. Progressives know they've gone too far to keep blaming Bush for their shortcomings. To suit the progressive fantasy, they seem to see the Confederacy is as good an anti-Obama scapegoat as any other that's out there. At least that seems to be the case for Mr. Thompson. Note: The Slate headline speaks of secession, and a footnote says Mr. Thompson has written a book with a secessionist theme. But, best I can tell, secession didn't make it into this Slate article, only fantasies of a rising or lingering Confederacy. Many people haven't paid much attention to the cluster known as Obamacare. They had health insurance, and assumed the law would leave them alone. How many cancellations? Florida Blue has sent cancellations to 300,000 Florida subscribers. Kaiser Permanente in California sent 160,000 notices, according to the article. And that's just two examples. This is not what people were promised when Democrats and President Obama pitched health care reform. Time to point to the president and say Liar, Liar, Pants on Fire. Apparently at least some Americans support the concept of an Orwellian police state. Why else would they sign a petition saying they did? Dragon Day is an independent film counting down to a November 1st release. American Thinker calls it a "Red Dawn for Intellectuals." But with China now in control of America's AMC theaters, what are the chances it gets meaningful theater bookings? The crackpot Dem is Congressman Steve Cohen of Tennessee. Sure, you've compared them to the Klan. But fellow Dem Steve Cohen has upped the ante. On Steve Kornacki's MSNBC show this morning, Cohen called Tea Party congressmen: "domestic enemies" that he took an oath to defend the country against. Did Kornacki challenge Cohen's libel? Hah! He merely observed that Cohen sounded "very pessimistic." Has the Tea Party ever helped to repatriate a Jihad assassin who would later open fire on American soldiers? Now ask the same question about Congressman Cohen. 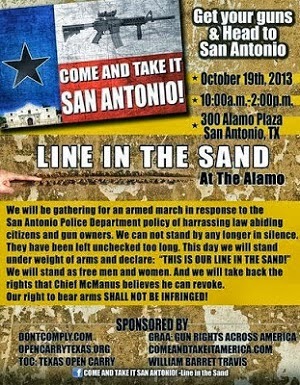 A Texas gun rights rally takes place today at the Alamo. And the political Left seems to be fretting that it's allowed to take place. 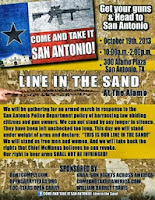 I've read in San Antonio media that Bloomberg's anti-gun group "Moms Demand Action" plan a counter event nearby. Had they been around in 1836, would Bloomberg disciples have gathered in protest of Travis and Crockett? They and others also brought guns to the Alamo. Seems to me, guns and the Alamo go way back. This article here is another good one to share with someone just now awakening to what's going on. Much of the advice also applies in dealing with preparing for, and dealing with, natural disasters. 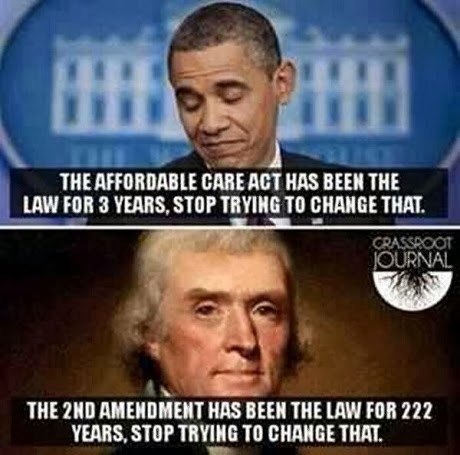 Nancy Pelosi continues to insist that Obamacare is about "the liberation of people to a healthier life of liberty, freedom to choose their happiness." Pelosi just sounds evil. She's like a guard herding people into boxcars, telling them a better life awaits in resettlement camps. Congress has blown another chance to exercise some control, and to begin putting America back on a more sustainable path. Instead, Congress chooses to keep us on the same progressive treadmill, while insisting better things are still waiting down the road. I'm not buying it. 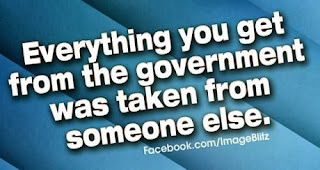 Trusting big government is a sucker's game. But CBS reports this time it involves smuggling grenades to Mexican cartels. 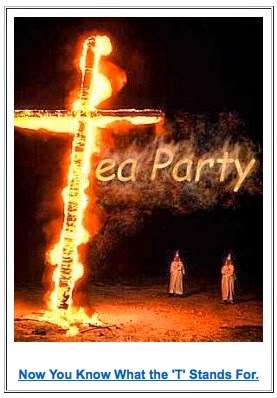 Violence against the Tea Party seems to be a collective fantasy of the Left. Actor Chris Noth seems to think it a good idea. Every Tea Party member should be horsewhipped. How do these Lefties think it's gonna go if things really do get physical? We can't seem to get Congress or the President to ban domestic spying on our emails and phone records, so let's let Kathleen Sibelius run the NSA. Let's make sure she takes personal control of the development of new computer systems. We will be safe for decades. Communications infrastructure once taken for granted may be fading away. A New Jersey community is being told copper wire phone lines won't be replaced after they were destroyed by Hurricane Sandy. Don and Doug (that's me) take a week off from our weekly radio round-up. Don has a matter that needs taking care of, I'm going to take advantage of the break to do the same. All should be back in order in time for an October 25th program. CBS reports at least one key player in the ATF's Operation Fast and Furious has been fired. More dismissals may be announced soon. What are the chances the disciplinary action goes wide enough or high enough into government ciricles? The White House continues to obstruct congressional investigators by citing executive privilege in the withholding of documents. With few exceptions (most notably reporting by Sharyl Attkisson at CBS), Fast and Furious never did get much play in the mainstream media. For months, the initial reports of the ATF "gunwalking" scandal were limited to bloggings and columns of gun rights advocates Mike Vanderboegh and David Codrea. Here's a link to the first report published at Vanderboegh's Sipsey Street Irregulars of what would eventually become known at the Fast and Furious scandal. There's no other explanation when you read stuff like this. At a public middle school in North Carolina, students were told a gunman was prowling on campus. And there was. Sort of. In a letter that was sent home to parents, the school said it was part of enrichment exercise trying to teach kids to be aware of their surroundings. A school employee dressed up in a ski mask and carrying a fake gun pretended to be a robber. Seems to me, there was actual intent to instill emotional trauma here. Never mind that a student with access to a cellphone might have called a parent or someone else nearby, pleading for help. Who would have been to blame if an armed civilian, or even an off duty cop arrived on campus - and shot the "intruder"? And the way some schools are run now, there's an outside chance an armed student, who'd smuggled a gun on campus, might have opened fire. "Enrichment exercise"? This was just a dumb stunt. A stupid exercise designed to make kids scared, and perhaps intentionally escalate fear of guns. If reports are accurate, this looks like serious stuff. Based on limited information, this looks suspiciously as if it may be a precursor to the next phase of America's fundamental transformation. Yet another bit of sell-out news. Obama has quietly released the auto manufacturer from a bailout requirement that it increase its production in the U.S. Instead, GM is spending billions of dollars building up its production capacity in ... China. 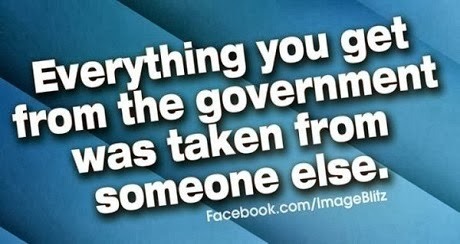 Government pats itself on the back for raising the debt ceiling while our nation's being robbed left and right. Obama and the "progressives" (both Democrat and Republican) are moving to finish what FDR started. If you view things in that light, yesterday's sellout on the debt ceiling and vote to reopen the government comes as no surprise. Republicans and Democrats alike gloated over the three month deal to reopen the government and raise the debt ceiling. But dig a little deeper, and the "compromise" reads like an Enabling Act, ceding more power to the president on debt matters. Everyone was all oozy-woozy praising Sen. Mitch McConnell (R-KY) for his hand in crafting the deal. Wasn't until a few hours later that we learn the deal includes $2 Billion for Kentucky to upgrade a damn dam - apparently to help woo McConnell's hand in bring the overall plan to the floor. Congress will be back fussing over the budget again by January or February. But America will be a little weaker, a little more poor. While the president will have even more power. Can kicking has a price. Long term, it can't end well. Johnathan Jarvis, head of the National Park Service, admits consulting with the White House and the Secretary of the Interior over the decision to close national parks and open air memorials. But Jarvis insists the closures were his decision. The Obama administration, which has fired no one over scandals such as its Fast and Furious Mexican gun-running operation, its criminal negligence in the terrorist attack on our Benghazi diplomatic mission, or the use of the IRS to target and intimidate political foes, seems to have a curious obsession lately about ethics and competence in the U.S. military. From Day By Day Cartoon. 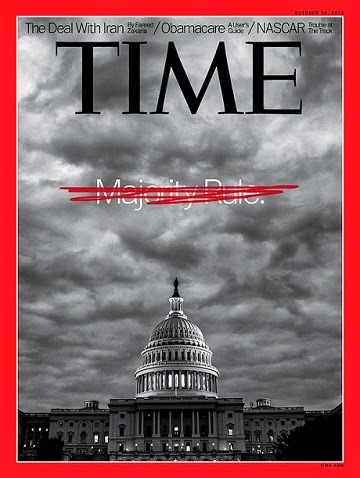 Chris Muir's title for it: "When Putsch comes to Shovel-Ready..."
In a bipartisan letter led by Senators Jerry Moran (R–KS) and Joe Manchin (D–WV), half of the Senate has officially pledged to oppose the ratification of the ATT. The signatories include every Republican Senator except Mark Kirk (R–IL) and five Democratic Senators. The letter, with its 50 signatories, ends any prospect in the foreseeable future of Senate ratification of the ATT. Question now is, will the White House still press for a formal ratification vote? Let the treaty matter die quietly? Or will the administration ignore the will of legislators and attempt to implement as many treaty aspects as it can by regulation and executive order? 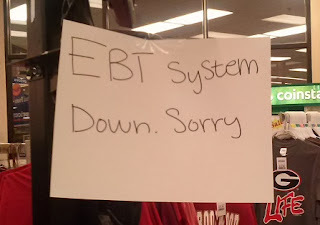 What if last weekend's "glitch" in the national EBT system was more than just a regular server update gone sour? Is there any chance what happened Saturday was the result of a government program that's grown too big too fast for its digital infrastructure to keep up with new and growing demand? If that's the case, additional outages may be expected. Of varying duration. What kind of reaction do you expect if these outages become more frequent. Or come in a longer duration? Things got pretty nutty in some places last Saturday. And what happened may foreshadow bigger things to come. Are you sufficiently prepped to spend some "duck and cover" time at home should things start getting screwy in the streets? Meanwhile, here's an additional set of post-EBT crash musings at Ace of Spades. Let's start with a hypothetical. Let's say you were a hard-left-wing commander in chief who wanted the military firmly in your corner. You'd certainly note that our armed forces have been a bastion of conservatism and Christian faith, and you'd know that its members generally weren't very fond of you. So how would you go about changing this? Click the link, and see where the author takes the scenario. Obama's Organizing for Action group put out a call in DC. Rally at the Capitol to put pressure on Republicans. You'd think in the midst of a government shutdown, they could do better than this. After two weeks of the National Park Service doing the president's bidding, putting forces in the field to inconvenience and inflict shutdown pain on the people, a park service police officers association tries to deflect blame back on Congress. "NATIONAL PARK RANGERS ASK PUBLIC NOT TO SHOOT MESSENGER"
Park Rangers are being assigned tasks that, at minimum, are an inconvenience to the public and that often deprive the public of their access to Federal lands and facilities. Closing National Parks is against our nature. The reason we became Park Rangers and love our profession is because we enjoy welcoming people from around the world to our national treasures, and providing for safe and enjoyable visits to these sites, while leaving them protected for future generations. However, there is a law governing government shutdowns, the Anti-Deficiency Act. Over the decades, multiple administrations have implemented closures under this law. We are unaware of any injunction or other court-issued document that has ever overturned the government’s authority in these matters. For those who believe they have standing, we urge you to seek legal remedies in court if you believe NPS actions to close park facilities to be illegal. Life would be much easier for us if the parks were open. Without any contrary court findings or changes in the law, we will carry on with this miserable, thankless, and pay-less task denying public access to parks during the government shutdown. Although our actions too often make sensational news stories and fodder for pundits -- they are supported by precedent and legal guidance from government lawyers, under laws we are sworn to enforce. The release makes no mention of a president who publicly refuses to negotiate with Congress. It seems to preclude that the executive branch has any latitude in the manner in which a partial shutdown is enforced. It attempts to blame all that's happened on law, legal precedent and the Congress. The lack of criticism for the administration suggests this NPS employee group is aligned with management in serving as political tools of the White House. The claim of just following orders rings hollow. In light of events over the past two weeks, the letter appears to be another attempt to rally pressure in support of the White House positions. Michelle Obama's much touted White House garden is now overgrown with the crops rotting on the vine. Under "shutdown" rules, gardeners are not allowed to harvest. So looting squirrels are having feast after feast. The latest proposal would reopen the government at current spending levels until Jan. 15 and extend the federal borrowing limit until early February, according to aides familiar with the talks. Keep kicking the can down the road. More pretending that government will get serious about its spending problems tomorrow. Or next month. By January at the latest. We lose a little more shape, a little more structural integrity with each kick. 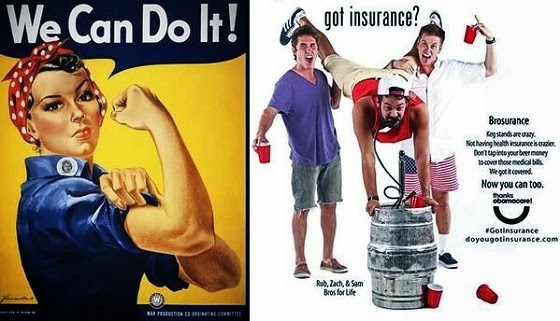 How much more kicking can the American "can" take and remain recognizable? Update: Subsequent reports say the White House immediately rejected the proposed plan. Guess we have to wait a bit longer for the next kick. According to data compiled by Challenger, Gray & Christmas, 10 companies alone have announced close to 75,000 job cuts this year, combined. This represents nearly 20% of all the announced cuts in 2013. 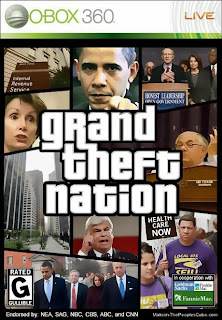 President Barack Obama is demanding a $1.1 trillion "ransom"--or else he will not allow the debt ceiling to be raised. That's the effective offer on the table from the president and Senate Democrats. They have now refused to pass a "clean" short-term debt ceiling hike unless Republicans agree to reverse the "sequester" spending cuts in the 2011 Budget Control Act that were enacted--at Obama's suggestion--to end the last debt ceiling crisis. Doesn't DC get it? Obama's going to crash the economy anyway. Maybe now. If not now, later. Why give him another trillion dollars to hurt us with first? The "deal" Obama wants amounts to an enabling act, something that amounts to a surrender of the legislative branch. The America of the Constitution grows ever weaker as Obama grows stronger. Congress needs to keep its oath, stand its ground, and hold the bully Obama in check. 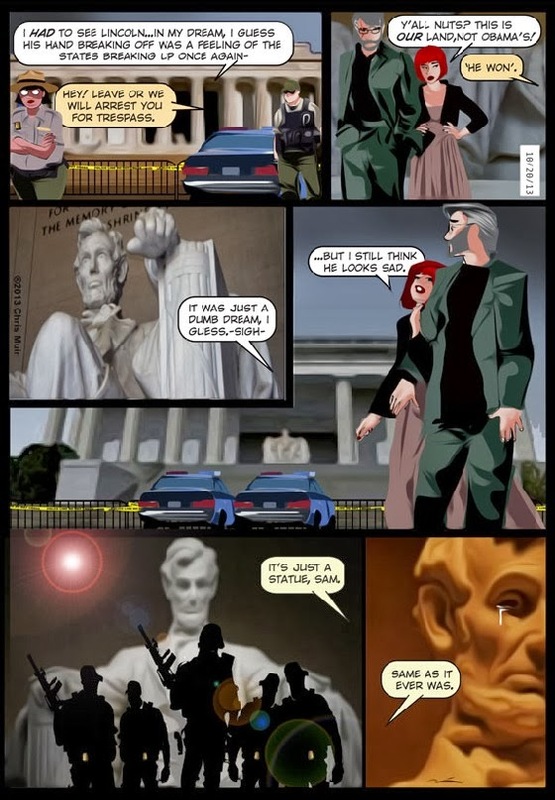 Chris Muir at Day by Day Cartoon updates Patrick Henry's thoughts for the Obama era. If the print's too small to read easily, use the link to access Day By Day's original. Participants in today's anti-Obama protests seem to express themselves well in this report compiled by Washington ABC affiliate WJLA. Around noon today, CNN's Jim Acosta reported some police shoving outside the White House. He's since reported the protest crowd has begun moving toward the U.S. Capitol. We read this as all Beretta 92FS weapons are banned. 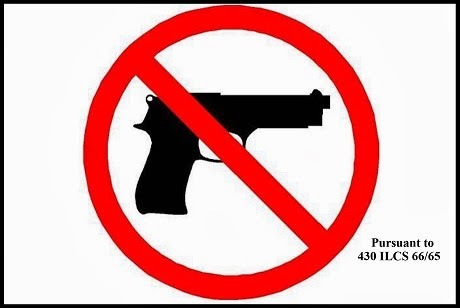 So if you carry a Glock, Smith and Wesson, Ruger, Sig, or other handgun, you ought to be fine. If you didn't realize what a lunatic Frances Fox-Piven was, you will after reading her latest assessement of the "Tea Party" and the American political scene. Frances Fox Piven continues to play her part in spinning Obama's progressive fundamental transformation and disparaging its opponents because Obama's game is largely a fulfillment of the socialist revolution she's always wanted. Times like these, make sure your pantry is well stocked, and fill up on gas when the gauge drops below 1/2 tank. I was also thinking earlier today that people who wanted to add extra firearm mags or ammo to their stash, but couldn't find 'em six months ago, should consider doing so now. Availability and pricing on both seem back close to pre-December 2012 levels. This almost seems just too convenient. "Electronic food stamp system down across nation"
Got your tin foil hats on? Some have predicted things like this might happen as an economic collapse nears, or as Mr. Obama's progressive transformation of America moves from "nudge" to "shove." While I'm not partial to conspiracy theories, it is quite the coincidence that this EBT glitch comes during a government shutdown - and on the verge of bumping into a debt ceiling. Sound kooky that the government might orchestrate such a thing as a means of applying political pressure? Who'd have thought three weeks ago that the national park and forest services could be transformed overnight into partisan Brown Shirts used to close parks, harass tourists, close businesses, and rip people from privately owned homes on leased federal lands. FYI: As of 7:45 pm, EBT was still down in Atlanta. "Any inappropriate remarks or jokes concerning security may result in your arrest." Orwellian, to say the least. This not the America the founders intended. And I doubt even our fathers or grandfathers would have tolerated acts like this. Apparently the White House has rejected the surrender all offer coughed up by Speaker John Boehner and other House GOP leaders. Obama wants a longer deal, according to the Washington Post. For those trying to follow the back story, it appears two Republicans in the senate were instrumental in Speaker Boehner's shift to progressive appeasement. The Post mentions Senators Lindsey Graham and Saxby Chambliss by name. Republicans, other conservatives, and libertarians in South Carolina and Georgia, please take note. Three law enforcement agencies responded? Armed anti-Obama demonstrator caused a stir today on an overpass in Cobb County, Georgia. The shutdown tug-o-war. Who's winning, who's losing? Also, bands of truckers are said to be encircling DC. It's just one of many push-back protests against the increasingly heavy-handed federal government. Protests are planned across the America's heartland as well this weekend. Will you be participating? And not all the battles being waged are against overreach by the feds. Some Georgia lawmakers got an earful earlier this week - and beat a hasty retreat from something they had proposed. We'll fill you in on the details. Don and I go live at 1:00 pm on BlogTalkRadio. Click here to participate. Update: The October 11th program is now available for replay or download. I've held back on blogging about it much about this. I like to actually see or hear from the grassroots before posting about any proclaimed grassroots movements. As of last night, WTVR in Richmond talked to some of the truckers who planned to participate in this weekend's protest in and around DC. Harrisburg's WPMT also found some in Dauphin County, PA.
Don and I will likely talk about the trucker's protest on today's show. We'd love to have calls from participating truckers. Independence Hall in Philadelphia was once best known as a gathering place for liberty loving patriots. It was the place the Declaration of Independence was signed. So, I have to say, it makes me kind of sick to see video showing the present regime in DC extending its tentacles to Philly, transforming Independence Hall into a showcase for a police state. As bad as the Battle of the Barrycades is in Washington, D.C., forcing WWII Vets to have to push their way past barricades at the WWII Memorial, Lincoln Memorial, Vietnam Memorial, and Iwo Jima Memorial, what the feds did at Mount Rushmore has to be the most petty and insane of them all. The feds didn’t just shut the access roads — even though the state offered to pay to keep them open — it erected cones along a viewing road in the distance to prevent people from pulling over to view the presidential monument. The executive branch, at the direction of President Barack Obama, displayed (and continues to display) open contempt for the people of these United States. I am disgusted to see Republican leadership in the House of Representatives now looking for wiggle room to quietly surrender to this bully president. Appeasement after what's transpired under the guise of a government shutdown will only embolden progressive tyrants to grasp farther and with a heavier hand next time. Some folks say they've had enough of California's nanny state. And they're not planning to move to escape it. The Sacramento Bee reports today on the growing secessionist movement in Northern California. It's urgent that members of the House hear from you. I read this morning that Speaker Boehner, Congressman Cantor, and others among GOP leadership are looking for an excuse to surrender to the progressive cabal, and move to fully fund Obamacare. Obamacare has shown itself to be fatally flawed. Now Republican leadership seems to want to claim the same distinction. Is there any way this madness can be stopped? Disenfranchising the Republican base, which holds to common sense, practical views on life, liberty and government, is not in the best interest of the nation or the Republican Party. In the past ten days, we've seen glimpses of that Obama's fundamentally transformed America as delivered to date. 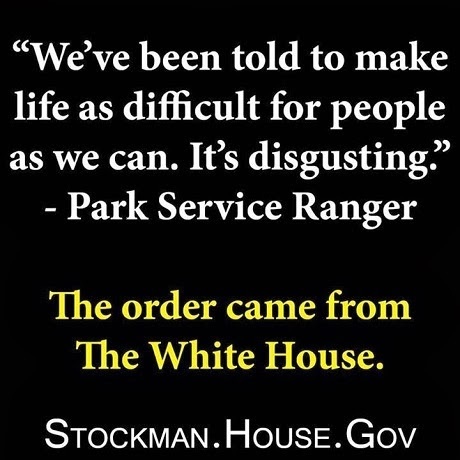 Elderly veterans bullied while visiting their own memorial, visitors to our national parks detained and ejected, private businesses shut down on the whims of bureaucrats - using guidelines dictated by the White House. The nation turned to the GOP in 2010 to stop this coming madness. 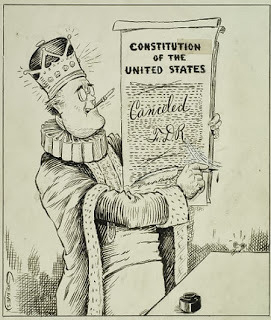 Sadly, the performance of the House since then, not counting ceremonial votes that carried no consequence, has seemed more in line with Europe's Quisling than the American Constitution. Please convey to Mr. Speaker and Mr. Cantor that, in my opinion, their disregard for the will of conservative Americans may well permanently divide, and perhaps destroy, the party of Lincoln and Reagan. Surrendering to Mr. Obama and Mr. Reid's senate, especially in light of recent intimidation campaigns waged against the America citizens, sets an especially dangerous precedent. To borrow a phrase from Nancy Reagan, "Just say no." Note: The link in the text was added to this posted version for clarity, it was not part of the original email. A gathering of patriots at the World War Two memorial is just one of the events. Will Obama flee the city so so he can pretend he doesn't see what's going on? "Obama is counting on the fact that who he is & what he's doing R both so outrageous that no 1 will call him on it for fear of sounding crazy" - Patrick Dollard (@patdollard) via Twitter (thus the shorthand spellings). It seems this congresswoman from Texas says martial law can be used to pass a spending bill in the House and get the government reopened. Is there something the Democrats would like to fill us in on ? "You have expected us" is a line previously employed by the hacktivist group Anonymous. The video below is two years old, and is largely dated. Operation Blackout. Engaged. We are Anonymous. We are legion. We do not forgive. We do not forget. To the United States government: You should have expected us. Now the question is, is what's happening in Arkansas part of a some kind of Anonymous affiliated operation, the work or copycats with similar goals, or the work saboteur(s) with other motivations who decided to false-flag with some Anonymous imagery to throw authorities off track? The FBI in Arkansas is investigating three attacks on electrical power infrastructure since August, the suspicions seem to be that the attacks are related. In one attack, graffiti was found at the scene. "You should have expected us." 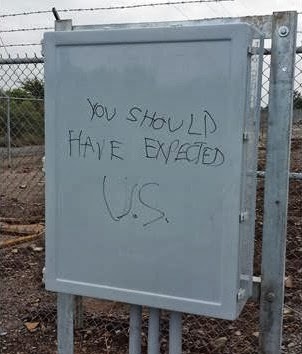 Or is that "You should have expected U.S."? America seems to get more surreal everyday. Update October 16: Suspect apprehended a few days back. A band of tourists unlawfully entered the historic Spanish-built fort in America's oldest city. The Castillo de San Marcos is closed as the Obama park service continues to bully Americans during the government shutdown. But wait. It was a guy from France who led this act of resistance? Are you old enough to remember when Disney produced shows like this? Think of it as a benchmark to help show how far we've fallen. The film is Johnny Tremain, originally produced in two parts for Sunday night's Walt Disney Presents in 1957. It's available on disc from Netflix. Amazon.com also offers rental or purchase. DC cops jumped through hoops seeking just the right guns for Dianne Feinstein to use as anti-gun press conference props. Dashed this off in an email this morning. I saw you on CSPAN this week expressing a belief that bi-annual budgeting would restore some bipartisanship, provide more workability to the federal government. I suspect you are dreaming, Mr. Isakson. Democrats call your party the party of Jihad, and they call your conservative constituents terrorists. And yet you seem to think a few rounds of Kumbaya and a two year budget will restore sanity in DC. Have you looked around the past week? In Senator Reid's Nevada, private owners were ripped from their homes on federal lands. If Mr. Reid allows his own constituents to be treated this way, can you really trust him to do right by the rest of us? A Massachusetts newspaper reports senior citizens visiting Yellowstone tell of park rangers acting like "Gestapo." The abuse at the hands of armed federal personnel was directed toward citizens and foreign visitors alike. Our veterans are insulted, death benefits are denied, access to national parks and memorials are blocked to citizens, yet illegal aliens and their allies are welcome by government to hold a mass rally on the "closed" National Mall. Members of our own Congress stage camera-op arrests to set example for their immigration warriors to repeat across the nation. No more. Hold the line, and roll back the size, scope and abusive powers of this government. Appeasing the president and the Democratic Party will only take us farther down the road to destruction. If you care at all about the America you grew up in, I urge you to immediately align with Senators Ted Cruz, Rand Paul and Mike Lee. We are on the verge of losing America as we knew it. You must be among those who rise to help save it. Have you written your congressman or senators lately? Update: A slightly reworked version has been sent to Sen. Chambliss as well. Who installed the barricades? Who ordered federal personal to make the shutdown personal and intentionally painful on everyday Americans? We've all read about the closures of private inns, campgrounds, and other businesses operating of federal lands. 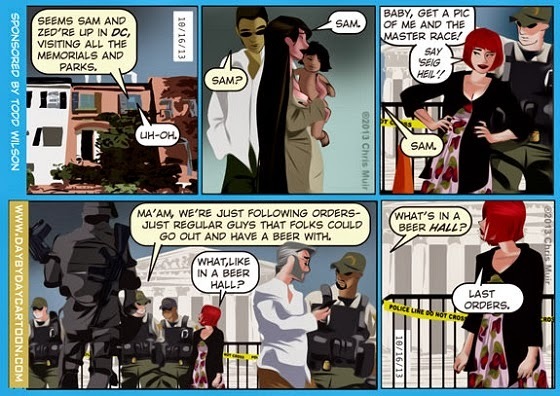 Obama's America. Operating in true bully fashion, it only picks on those too small to fight back. In light of the recent beating of an SUV driver at the hands of an enraged motorcycle mob, Oleg Volk offers some thoughts about firearms and self preservation if you're forced to fend off attackers while behind the wheel. Using small arms is often preferable to using the vehicle in a defensive fight, as many cars are designed to shut off in case of even a minor accident. For example, Ford Crown Victoria/Mercury Grand Marquis will turn off the fuel pump in case of even a minor rear impact. Running over bikes can cause tire damage which would make high-speed escape impossible or dangerous to the car occupants. Even a small impact at speed can cause the vehicle to lose control and skid out. Police in Gwinnett County, Georgia have charged an 84-year-old suspect with pointing a gun at Obama impeachment demonstrators. 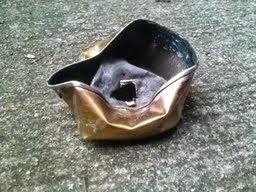 Police say the guy was totin' a .32 Colt semi-auto. 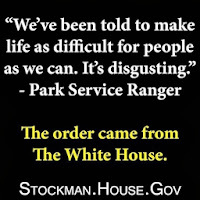 When Mr. Obama said this back in 2008, I wonder if he contemplated he'd be shutting down national parks and monuments, and using uniformed federal officers to bully senior citizens and other tourists. Not my choice of words. They're ripped from a real newspaper headline describing how seniors are being treated by federal authorities during the Obama shutdown. The tourists were treated harshly by armed park employees... so much so that some of the foreign tourists with limited English skills thought they were under arrest. The Statue of Liberty is closed. And a teen with a life-threatening illness is turned away. The arrest of some "Vietnam veterans" in New York City is being pitched in some media as being intertwined with the federal government shutdown story. Last night's arrests were totally unrelated to the shutdown, and were more in line with simple trespass arrests by New York authorities after peacenik John Kerry wannabes refused to leave the memorial site after a long established closing time. The Conservative Tree House breaks it down nicely. Choose your battles. And vet your information. 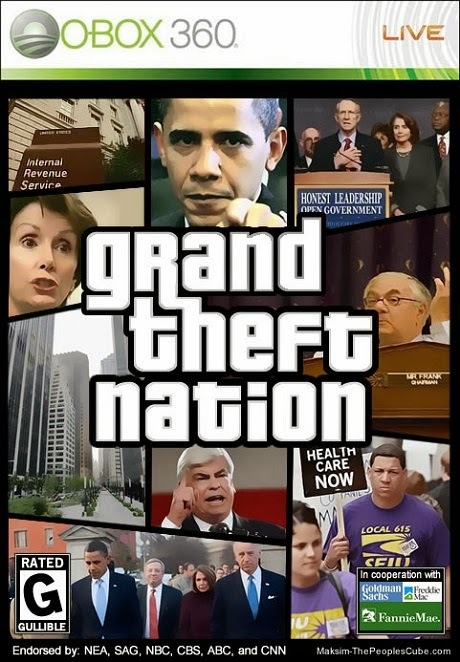 Many will try to exploit the momentum as Americans begin to reawaken. Congress pretty much forced the Air Force to buy a bunch of planes it didn't want. Of course, members of Congress also got campaign contributions from PACs aligned with the planes' manufacturer and associated with a corporate partner. Pruning the Bill of Rights appears to be a progressive inspired assignment given to some sixth graders in an Arkansas school district under the new federal Common Core curriculum guidelines. 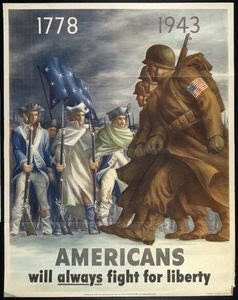 America's schools used to teach respect for America's founding principles and guiding documents. Today's schools appear to be actively engaged in undermining belief in the founder's America. In 2010, it was a spoofy video game poster. In 2013, it's political reality. Are you gonna let the progressives get away with the goods? But the mall's closed, right? World War Two vets had to break through barricades to get access to their memorial. People who have homes or businesses on leased federal land are being told by the National Park Service to get out. But now comes word that the same Park Service is welcoming an amnesty rally on the National Mall in DC tomorrow. Susana Flores, a spokesperson for the rally, confirmed for the Washington Examiner that the Park Service will allow the event to take place under the group's rights granted by the First Amendment. Yes, the mall remains "closed" and the Examiner notes barricades saying so continue to dot the landscape. 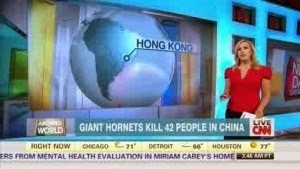 Just cuz it's on cable news doesn't mean it's true. Do the editors at Time understand that the United States of America is a republic, and not a democracy? Mom had me practice that line when I was learning to type. She learned it when she was learning to use a typewriter during WWII. Team Obama rips an elderly couple from their privately owned home, and tells them they can't return until the shutdown ends. In 2008, Obama promised hope and change. In 2013, it's clear his game is intentional pain. The progressives' Dear Leader has been a deceiver from the start.